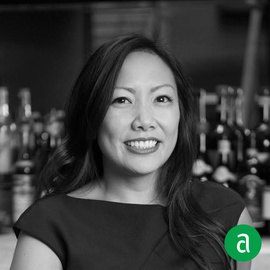 Anncherie Saludo, Beverage Director at L'Artusi in New York City, shares her career timeline and advice for up-and-coming talent. Showing initiative whilst expressing passion and a willingness to learn is what I look for when hiring. I honestly didn’t know this position was right for me until I was giving it my all. I had been approached several times to work in more of a beverage and management capacity, but never felt quite ready to step up. By my final year of graduate school, the timing seemed like now or never. That first year was one of those defining moments where I truly discovered how much I am capable of. I was working a more than full-time job and attacking schoolwork during any spare moments. I’m still amazed I made it through graduation. I find inspiration through others. Those who consider themselves novices often offer insight to wines or regions I may not have the time with which to stay current. In listening I gain perspective on how better to tailor my approach to everyone. Enthusiasm is infectious – an adage that rings true for how I help keep my staff motivated to learn and get my guests excited for the delicious glass they are about to enjoy. I take every opportunity to host winemakers and other beverage experts from whom my staff might learn. When I return from travels abroad, we take time to taste wine from those areas, so that we may all gain a deeper understanding. On occasion we also taste wines from outside Italy, in order to keep in touch with what our guests might request and how we may find alternate selections within our all-Italian list. Some sources of information that have really contributed to my profession have been anything written by Jancis Robinson, my teachers and education materials at the Wine and Spirits Education Trust, Levi Dalton's "I'll Drink to That" podcast, David Lynch and Joe Bastianich's book Vino Italiano, Ian D’Agata’s book Native Wine Grapes of Italy, and Terlato Wines International's "Angelo Gaja's Notes on Langhe Vintages, 1958-2011." Spreading the love amongst purveyors is beneficial. Tasting through the good, bad, inexpensive and unquaffable is a big part of my education. When I began with the company 8+ years ago, I was leaving another restaurant that was owned by a chef who is now my sister-in- law. When that closed, I sought another restaurant whose staff I could call family – a place where I truly enjoyed the people I worked alongside everyday. I approach everything with a willingness to learn because we all have different knowledge and experiences to share. Even brief connections can leave lasting impressions that feed my energy to inspire others about the things I am truly passionate about. There are a few things that would cripple my ability to do my job well and cannot live without: loss of sight, smell and taste, my wine key, and lots of spreadsheets. My L’Artusi family has really supported my growth into a wine professional. The mentorship I’d received under Joe Campanale has truly had an impact on my career trajectory. His passion for wine is absolutely infectious, and it nudged me into my initial pursuit for more formal wine education. The knowledge I’ve gained from Joe and our previous Beverage Directors has helped me further hone my niche knowledge of Italian wine. My L’Artusi family recognized my potential in connecting with guests and educating others. They further challenged me to take on a more serious role, and that’s when I stepped into my current position. I continually educate myself via extensive travel and tasting, spending time learning from winemakers, and through fantastic seminars hosted by other industry professionals. Organization is key. I set up little checks and balances for myself to help stay on top of what is coming in and out of the door, on or off the list. Keeping an open mind is also extremely important, as there’s always something new to learn, discover. Approachability is another must, and a quality I’ve learned from my predecessors. Wine can be a beautiful, elevated thing, but also an easygoing, everyday affair. Alongside others, I’ve worked hard to dispel the pretension that has surrounded it for far too long.